Last year, I grew my SEO traffic by about 1,320% to my blog despite only writing less than a dozen posts. A lot of people have written about keyword research, link building and building domain authority to get more SEO traffic, but one of the most commonly overlooked tasks when setting up a WordPress website is setting it up so that it is SEO friendly to begin with. Most people don’t know too much about SEO, so it’s not surprising that these features are so commonly overlooked. 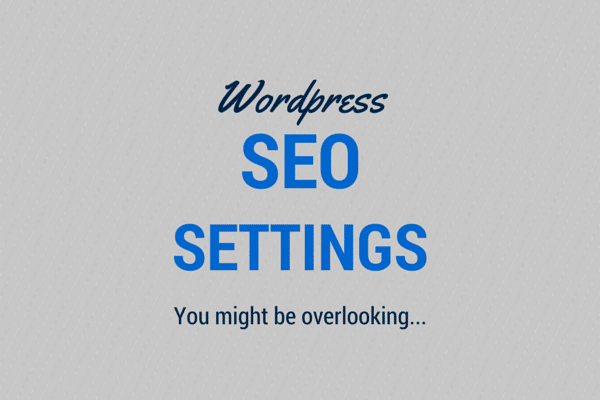 However, setting up your WordPress site for SEO is important. Ignoring these steps can significantly reduce search engine traffic to your site. The good news is that it doesn’t take too long to do and it’s pretty easy if you follow these simple steps. You should be able to complete these steps on how to set up SEO in WordPress in under a half hour. There are tons of plugins for SEO for WordPress, but the only one you really need when you get started is Yoast SEO. Yoast is an all inclusive plugin that contains everything you need to make your site SEO friendly. Note that some people prefer using All-in-one SEO plugin instead of Yoast, but they both do practically the same thing. In this article, we’re just going to go over the SEO Yoast settings. You may also want to consider using a caching plugin like W3 Cache. When people visit your site, caching plugins will store your web pages into memory on their computers so that it does not have to reload the page every time they visit. This caching can improve overall site speed, which is good for SEO. Once your website starts making good money, you will want to upgrade to a better web host that will allow caching on their server without requiring you to use a plugin. Having too many plugins can slow down the load time of your site, so unless you need to, refrain from using any other plugins. Most people get the general settings right, but we’ll go over it anyways for those who are new to WordPress. After logging into WordPress, click on “Settings – General”. Enter the Site Title (the name of your website). The site title and tagline are sometimes used on the site, depending on what WordPress theme you are using and what options you have activated on your site. Also replace the default tagline text with something more appropriate for your website. The tagline is generally a short description of what your website is about. 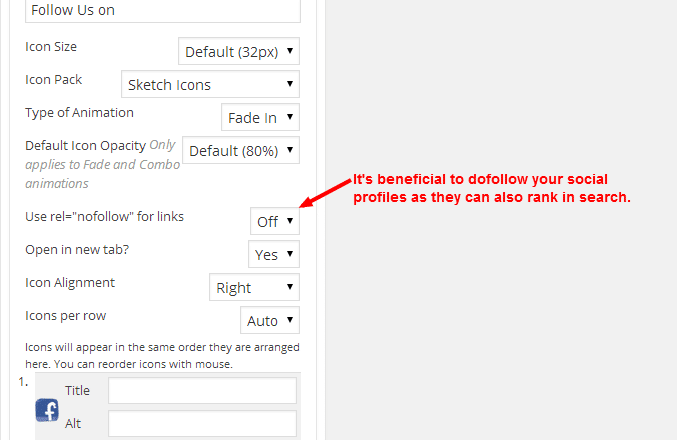 For new sites, you can choose to default to either the www or non-www version of your site. Technically, however, there is no SEO benefit of using www vs non-www. In other words, from an SEO perspective, they are both the same. However, the www version is recommended since many people will type in www in front of a website URL by default, including when they link to your site. After you are done with the General Settings, click on “Settings – Permalinks” and select the “Post Name” radio button. This permalink setting will create SEO friendly links for each post and page and make it easier for people to link to the URL’s. The Yoast SEO plugin attempts to combine just about everything you need for SEO into one convenient plugin. Most people just install it and then think their work is done. Although the default settings are acceptable, you can optimize for the best Yoast SEO settings with a few simple changes. If you want to verify your webmaster tools, there are some convenient fields that you can fill in on the Yoast dashboard. 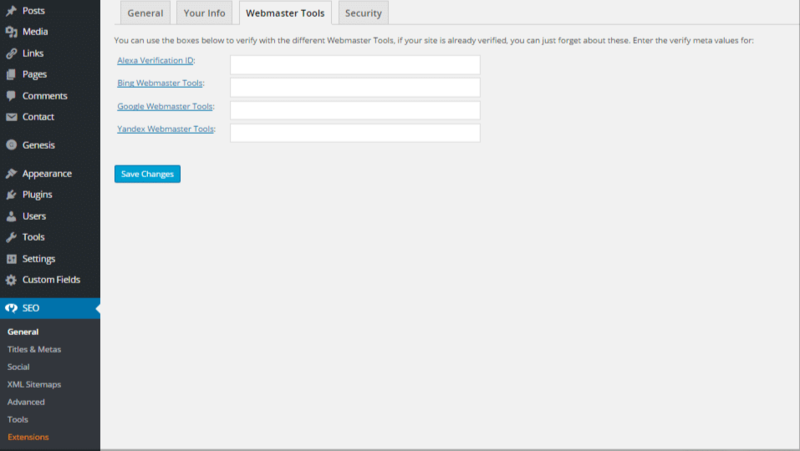 Just click on “SEO – General” and then the “Webmaster Tools” tab. Then fill in the fields. You can click on the links on the left for more details. If you have already verified these accounts, then you don’t need to do this step. Most of the important settings are under the Titles & Metas field. Notice there are also 6 tabs in this section, including General, Home, Post Types, Taxonomies, Archives and Other. On the Other tab, check the box to Noindex the archive subpages. Generally, archive subpages will look the same and not contain any unique content so best practice is to Noindex them to improve the user experience for visitors as well as avoid on site duplicate content. 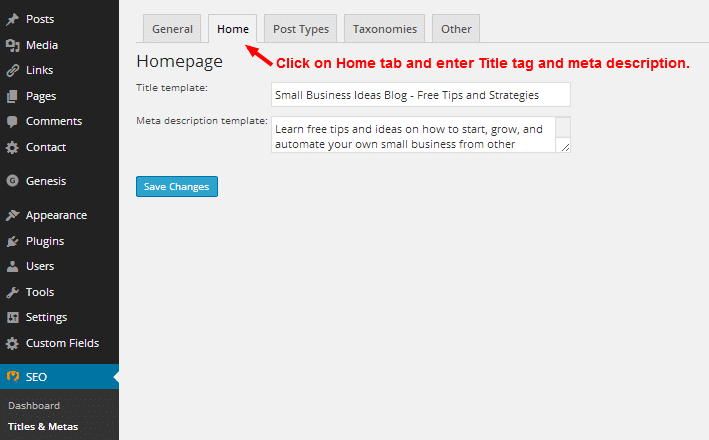 On the home tab, you can enter your Title tag and meta description field. Be sure to do this step as it is one of the most important parts of your website’s SEO set up. On the Post Types tab, I like to change the default to Title only. Ideally, you should be entering your own title and meta descriptions for each post that you write so this tab shouldn’t matter too much. Leave Media as “Noindex, follow”. On the taxonomies tab, keep the category pages indexed. Best practice is to add a unique description on top of each category page. Some templates allow for this feature, but if not, a coder should be able to implement it. Noindex the tags and formats. For most sites, tags will only create duplicate content pages that are of little value to visitors. Also, when tags were indexed for this site, only 3 visits per 1000 came from tag pages so they usually don’t send much search engine traffic anyway. On the “Archives” tab, you can disable the author archives by selecting NoIndex and the Disable author archives boxes if you are the only author for the blog. For multi-author sites, leave these unchecked. Leave the date archives as noindex to prevent duplicate content from getting indexed in the search engines. Adding Google Plus information here use to be important until Google decided to nix it’s authorship program. However, you can still add your social media accounts in this section if you want. 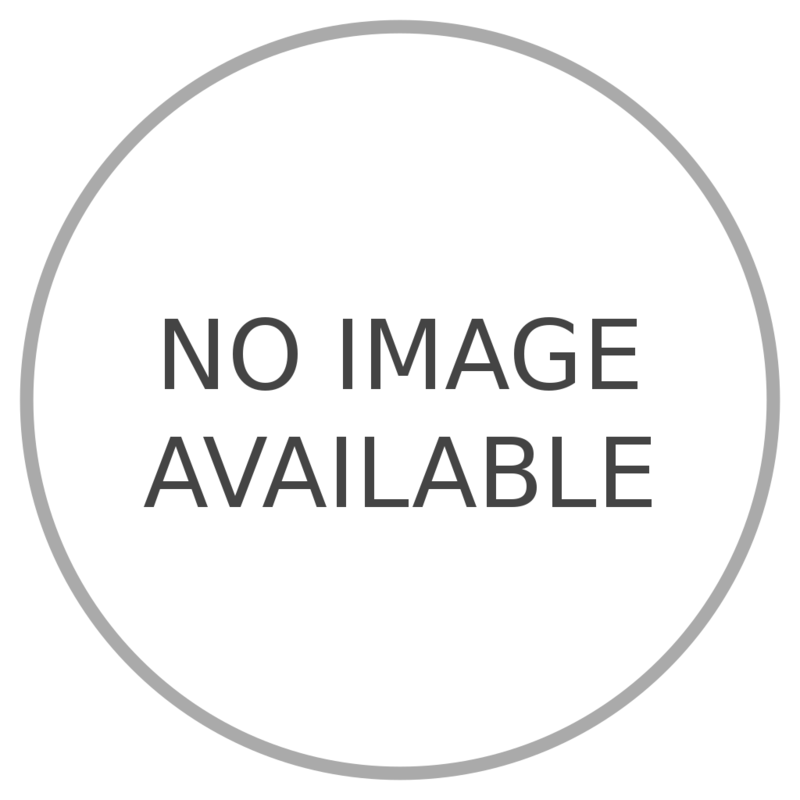 I used this section to add Twitter cards, which can increase the visibility on Twitter when someone tweets something from your site. Leave the XML Sitemap field checked. You don’t need another plugin for sitemaps. The most important items that should be in the sitemap are posts and pages which are included by default in the sitemap (under Post Types tab). Media is excluded by default, which is fine. Click on the “Taxonomies” tab. 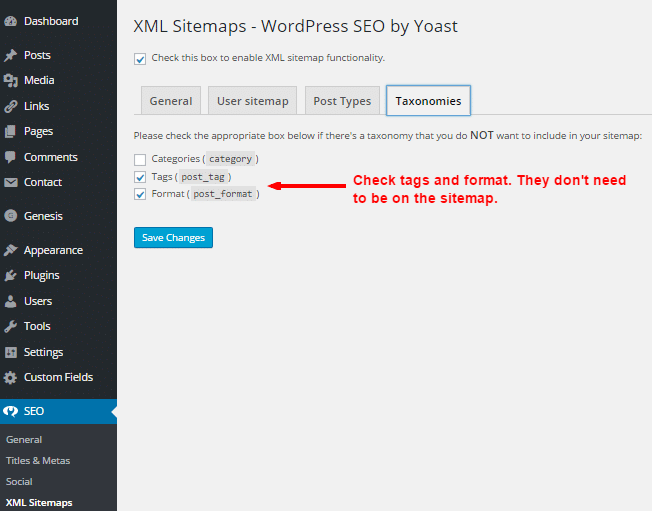 Exclude tags and format from the sitemap. Categories are optional and some people will exclude them while others will include categories. 1) You can add your Google Plus URL for the user’s profile page. This isn’t critical any more since Google killed its authorship program. 2) As a best practice, also fill out the biographical info. Some themes will use this info in the author box. 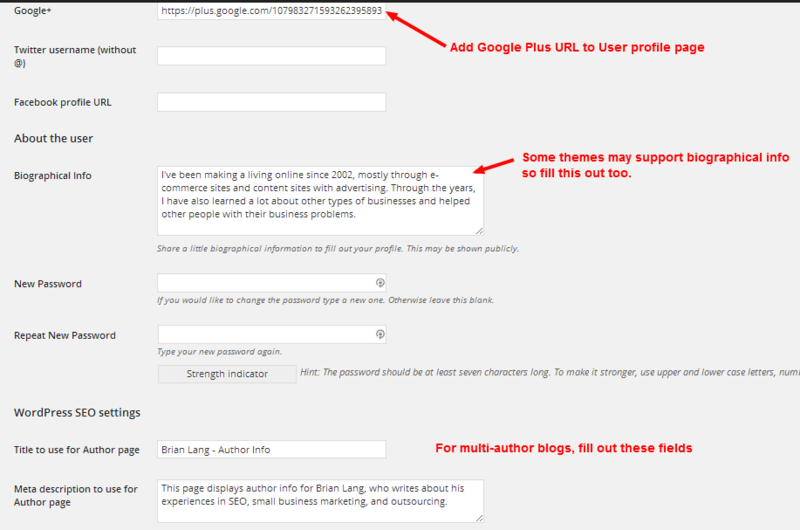 3) For multi-author blogs, also fill out the fields under WordPress SEO settings (SEO – Titles and Metas – Archives). These title tags and meta description fields will be used on the author pages for each author. As a best practice, it is a good idea to dofollow your social accounts so that they might rank in the search engines as well and send you traffic. Some social media profile plugins will have options for this. The plugin shown here is called Social Media Widget. These simple steps don’t take long to do and once you’ve set up your blog, you’ll be ready to reap the benefits of getting more SEO traffic. 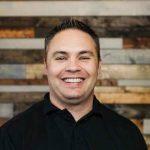 Brian Lang is the founder of smallbusinessideasblog.com, where he shares tips and ideas for business and online marketing. If you want to grow your site traffic and find out what tools he uses for SEO and online marketing, be sure to download his free resource, 50+ Free Tools and Resource to Grow Your Business. Check out Long Tail Pro today for a FREE 7 day trial on your keyword research. Thanks for your good and precise description of Yoast settings!! Really interesting! Great article, I like the descriptions and screenshots. Keep up the good work. It was very convenient to read an explanation of the important features in Yoast. Do you use the premium version? I got really confused when I read the part about using http://www.example.com vs http://example.com. I tested both links and they both work just fine. Are you sure that it is necessary to change the wordpress default? Do you know how to set all your internal links to follow and all external links to nofollow? This would be a great post. Thanks again and great job. I highly appreciate the useful details you provide us. Thank you very much! Very helpful post for all WordPress beginners. 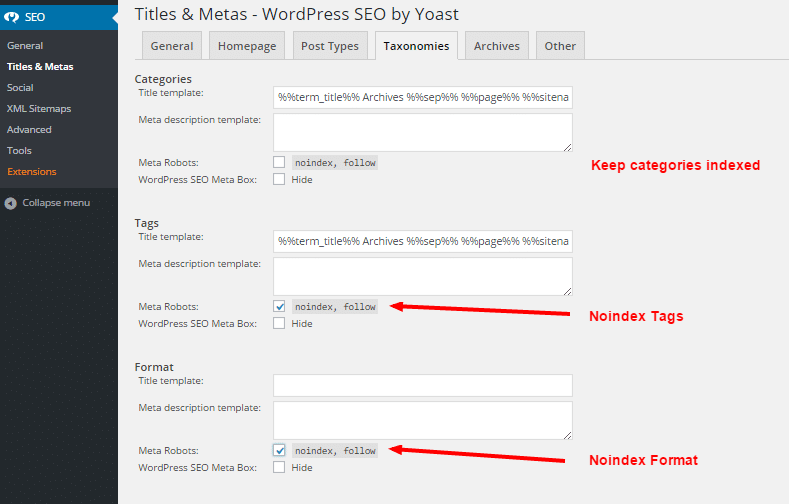 These settings of WP and Yoast, are important to optimize the WP site/blog properly. Additionally use some plugins to implement the structured data on the WP and use plugins as few as possible, otherwise the site will load slower which may hamper ranking and UX. 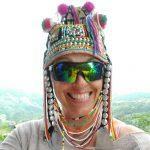 Hey sonia can you please tell what are the plugin which we will need for schema.org. I actually love using Yoast plugin for my wordpress site seo. It’s so amazing that even a normal people like me can use and implement it. The accuracy of yoast is amazing. Thank you so much for the step by step guide to Yoast SEO. It improved SEO and crawling rate of my website ? i’m looking for wordpress seo theme which is seo enabled right out of the box so that i dont have to install and setup seo plugin over and over again each time i create new site. and boy, that is hard thing to do. cant believe it, 2018 and still none proper seo theme yet. Good luck Lokesh, thanks for your comments. Previously i use other plugin for my sites. But when i changed it to YOAST Seo, most of my target keywords is starting to appear in google. 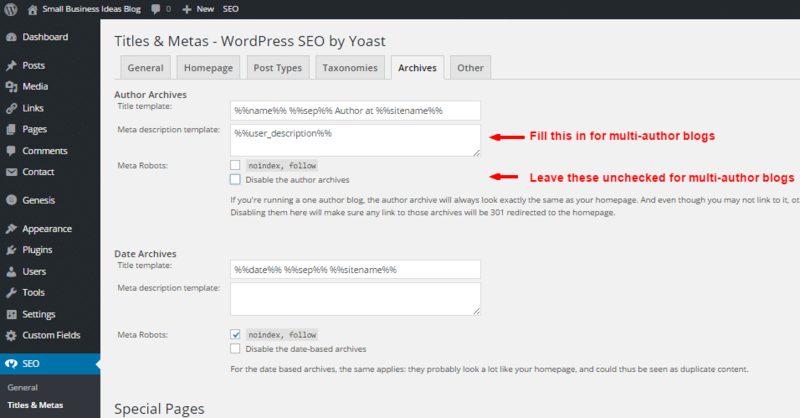 Yoast is very easy to use and they have their own meta data too.. Thanks Long Tail Pro Team for this complete and awesome SEO Setting guide ! Instead of Yoast I am using All in one SEO nad Google Webmasters (search console) is cool too.